Meryl Davis and Charlie White leave the ice after skating in the free dance during the Prudential U.S. Figure Skating Championships at TD Garden on January 11, 2014 in Boston, Massachusetts. One gold medal, one silver. That was the U.S. figure skating haul, if you want to call it that, from the last Winter Olympics. Sounds about right for the Sochi Games, too, but only because of the addition of the team event. Meryl Davis and Charlie White, Vancouver runners-up to their training partners from Canada, Tessa Virtue and Scott Moir, are favored in ice dance. Once a discipline in which Americans struggled to sneak into the top 10 in international competitions, the quick-step and twizzle crowd has been ruled this season by the American couple affectionately nicknamed Marlie. They are world champs for the second time, and they routed the field at the Grand Prix Final. Now the Olympics, and they are the ones pursued. They say they are ready. 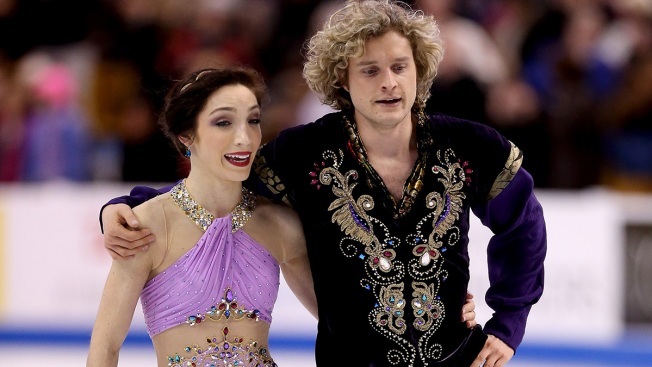 "I don't know that it has anything to do with our Olympic experience in 2010 as much as it does with our 16 years of skating and competing together," Davis says. "We really truly have put a significant amount of pressure on ourselves as it compares to the pressure from any sort of outside force. "I think because we expect so much out of ourselves, those expectations that have slowly been coming in over the years, especially since the last Olympic Games, I don't think they really play a huge role in the way we approach competition because we have grown so accustomed to expecting things out of ourselves." Not only are they the best U.S. bet for gold, but for any spot on the podium. Another American winning an individual medal would be surprising. But as a nation, the United States is in solid shape for the new team event. Although South Korea, Japan, Germany, China and Russia all have top contenders in the various competitions, across the board only the Americans, Canadians and perhaps the Russians are deep. For the U.S. to grab team gold, it will need strong performances from ice dance. That means Marlie; Madison Chock and Evan Bates and siblings Maia and Alex Shibutani are Davis and White's compatriots — and the women (Gracie Gold, Ashley Wagner and 15-year-old Polina Edmunds). It also will need at least solid showings from the men: four-time national champion Jeremy Abbott and 19-year-old newcomer Jason Brown. Same thing from the pairs: Marissa Castelli and Simon Shnapir, the U.S. winners, and Felicia Zhang and Nathan Bartholomay. It seems doable, but Canada can pretty much match or surpass the American squad everywhere but in the women's event. "We are going to be out there for each other and that is something that is a little bit different," White says, "but something all of Team USA is excited about." Gold was among the most exciting things at the national championships, convincingly winning her first title with grace, precision and athletic skills. She'll be up against defending champion Yuna Kim of South Korea and 2010 runner-up Mao Asada of Japan. Beating them would be a major upset. "I was able to do it at nationals, and in practice. You have to try to treat the Olympics like any other competition, but leave everything out on the ice. Don't hold anything back." Abbott has always struggled internationally in such an environment. He's one of the most accomplished U.S. skaters in domestic competitions, matching the likes of Olympic champions Scott Hamilton and Brian Boitano in national crowns. But he hasn't come close to medaling at worlds or the Olympics. "I feel much more grounded and on track," says Abbott, who was ninth in Vancouver after beating eventual Olympic gold medalist Evan Lysacek at nationals. "After having gone through the last Olympic experience I learned so much, and I really think I know how to handle the pressure this time. "It's a whole different ballgame for me. Last time was really kind of jumping in blind. This time, it is very planned and very organized, and I think I have given myself the best opportunity to be as calm and focused as I can be in Russia." Wagner struggled mightily at nationals but was selected to the team ahead of third-place Mirai Nagasu (who finished fourth in Vancouver) because of her impressive record representing the nation. Considered strong-minded and even unflappable in previous seasons, Wagner's flop in Boston and her decision to change her free skate program might smack of panic. But Wagner also has everything it takes to overcome such problems. As she said after being selected to the team: "I danced with danger. ... I never want to feel that uncomfortable again. I'm ready to train so that when I show up in Sochi I'm the Ashley Wagner you have seen for the past couple of years." Even if it doesn't get her on the individual podium, that could provide a big boost in a team competition the Americans say they're primed for.